Army Sergeant Jorge Zapata was raised in East Tennessee. At the age of 19 he enlisted in the United States Marine Corps, and began his training at Parris Island, South Carolina. After his graduation he moved onto Camp Lejeune, NC for additional training specializing in Combat Engineering. As a Combat Engineer, Sgt. Zapata's duties involved obstacle breaching, bridging, base fortification, and demolition. 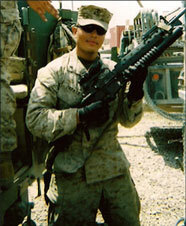 During his deployments overseas he was always attached to infantry units. Zapata and his team provided support during mounted and dismounted patrols finding and neutralizing Improvised Explosive Devices (IEDs). His team also located and destroyed weapon caches. Zapata completed two full tours. In November of 2006, Sgt. Zapata was critically wounded when his humvee ran over an IED in Iraq. He was immediately transported by medavac to Landstuhl, Germany, where he was treated and stabilized for his injuries sustained. The bones on his right lower leg were shattered. From Germany he was sent to Balboa Naval Hospital in San Diego, California where he underwent surgical procedures, and began what would be at least a year of physical therapy. Sgt. Zapata was diagnosed with post traumatic stress disorder (PTSD), and a traumatic brain injury (TBI). He was awarded the Purple Heart, the Navy and Marine Corps Achievement Medal, Iraq Campaign Medal, Combat Action Ribbon, Global War on Terrorism Service Medal, National Defense Service Medal, Selected Marine Corps Reserve Medal, Good Conduct Medal and the Sea Service Deployment Ribbon. Sgt. Zapata was the recipient of a home in Orlando, Florida.